Breitling Watches are extraordinary. This watchmaker has loads of technology and innovation that goes into their fine precision instruments. Be aware that because of their popularity, there are fakes out there. Breitling is quite proud of the work that has gone into creating these timepieces and the reputation they have gained. The company wants to warn consumers to make certain they buy only authentic Breitling watches and not replicas…I mean, what’s the point? You are purchasing the excellence not just the name. The Airwolf is one of Breitling’s most awesome watches. Equipped with all the needs of a professional aviator, the Airwolf is a marvelous instrument. This chronograph has dual digital windows on the face and a perpetual calendar. The watch is back lit for easy night time reading, and a compass scale. 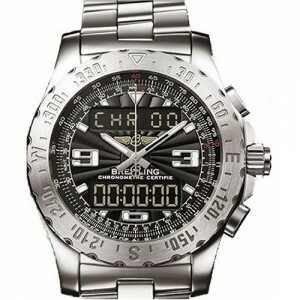 This Breitling watch is water resistant to 5 bars, and is encased in strong stainless-steel. Breitling prides themselves on their attention to detail and has built a fantastic reputation as professional timekeepers, but as any professional pilot or diver can tell you…these watches do much more than just keep time. The instruments that Breitling watches creates take in to account all aspects of the professional wearing them, that’s attention to detail at its best! Considerably, the report is truly the freshest on this notable topic. I agree with your conclusions and will thirstily look forward for your next updates.I will immediately grab your rss feed to keep abreast of any updates.